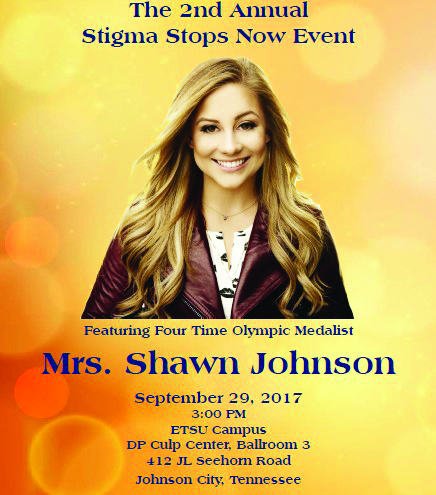 Four-time Olympic medalist Shawn Johnson will speak Friday, Sept. 29, in the Culp Ballroom at 3 p.m. as part of Buctainment and Frontier Health’s second annual Stigma Stops Now event. Johnson will speak about her struggle with depression and recovery, and self-image issues. Her inspiring story of being a young female athlete competing on the Olympic stage is one of courage and determination. Johnson won four medals including gold on the balance beam at the 2008 Summer Olympics, in Beijing, China, at 16 years old. Johnson’s “Olympic Champion-Stories Behind the Smile,” was published in January 2009 and in April of that year, Johnson was named the 79th Amateur Athletic Union Sullivan Award recipient, one of the United States’ most prestigious honors in amateur sports. At age 17, she became the youngest ever contestant, and subsequently in May 2009 was crowned champion, of ABC’s eighth season of “Dancing with the Stars”. Johnson was invited back for “Dancing with the Stars: All Stars” where she again made it to the finale. The event is free to the ETSU community. For more information, call 439-6633 or email sorc@etsu.edu.